Our signature California sun dried apricots covered in rich milk chocolate and coated with pastel chocolate. An apricot lover's dream! Packaged in a 3 oz. bag. 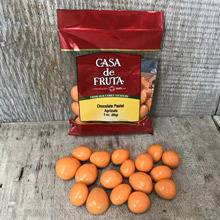 Ingredients: Pastel coating (sugar, palm kernel and palm oils, whey, nonfat milk, soy lecithin, vanilla), dried apricots (with sulfur dioxide to retain color), milk chocolate (sugar, whole milk, cocoa butter, cocoa mass, soy lecithin, vanilla), sugar, citric acid, tapioca syrup, natural flavor, tapioca dextrin, artificial color (yellow 6 lake), confectioner's glaze.